UDM Downloads > LockGear Enterprise! 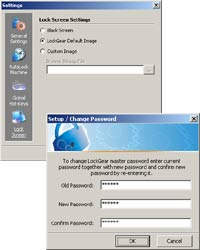 LockGear Enterprise is a powerful and easy-to-use software utility that allows password protection of your system from unauthorized access when you are off your workplace. You can lock computer off by double-clicking system tray icon or pressing a hot-key. Also LockGear Enterprise can automatically lock your computer after a period of idle time (when not using computer). Running and launching in Normal or Stealth modes. Flexible configuration options.